When you think of Texas, Dallas is certainly a city that comes to mind. 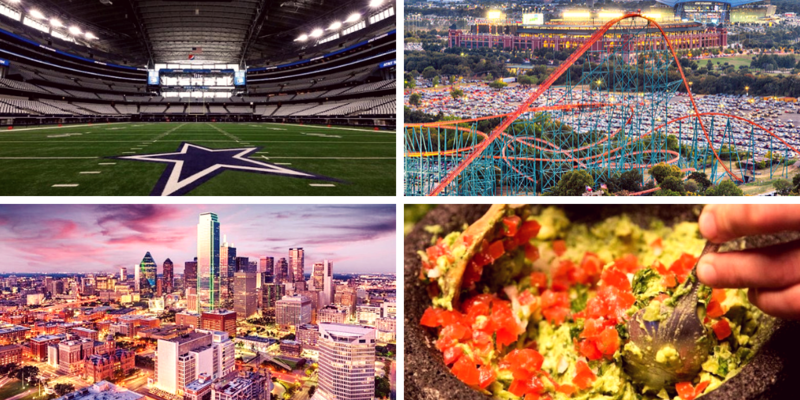 Think Dallas Cowboys, Tex-Mex, and a sprawling metropolitan area in one of America’s largest states. Everything really is bigger in Texas and you’re sure to find something for everyone in this city. Dallas is often confused with its neighbors, Fort Worth and Arlington. But not only are these separate cities, there are some not-so-friendly rivalries between them. Make sure you don’t get them confused with each other or you might upset your new neighbors. No matter where you live in Dallas, you’re bound to encounter some traffic during your daily commute. Unlike other big cities such as New York City, however, it’s difficult to get everywhere you might need to with just public transportation. As such, be prepared to drive and sit in traffic. You’ll want to pick the neighborhood you live in with some consideration for where you’re going to have to work. You’ll find that housing prices haven’t gone up in Dallas like they have in many metropolitan areas. Even residents in their 20s can generally afford to buy a house or condo here. You’ll want to pick your neighborhood based on what you desire as different areas are vastly different within the same city. Dallas residents tend to have a high amount of disposable income, largely due to the low cost of living and the corporate jobs present. You’ll find that people eat out regularly, and you’ll have your choice of cuisines. Two of the major options are barbecue and Tex-Mex. Be prepared to eat a lot of both of these while you’re blending in with your new city. If you’re moving to Dallas, know now that it is one of the USA’s largest cities – and it’s constantly growing. This booming aspect contributes greatly to traffic, but it’ll also provide you with plenty to keep you busy. There are museums, historic sites, and dining options to suit even the pickiest resident. When you come to Dallas, you need to be prepared for extremes of every weather variety. Tornadoes happen, and they can be scary. In addition, you’ll find hurricanes, hail storms, and flooding can be serious problems. While you’re getting used to the weather extremes in Dallas, know that several months out of the year it’s hot! You’ll really appreciate the cooler weather that occurs between October and April before it starts heating up. Plan summer escapes, such as to the water, to enjoy swimming and jet skis. Dallas residents like an excuse to dress up. When you move to town, if you don’t have a tuxedo or cocktail dress, you’re going to want to go shopping. You’ll find that your neighbors glam up for events that in other towns might only require a simple dress or suit. Don’t stand out for showing up in jeans. Dallas is the home of the Texas State Fair, and you’ll be greeted by the site of Texas’ tallest cowboy when you arrive. “Big Tex” is a 52-foot tall statue that stands at the entrance to the fair. While you’re there make sure to try the different cuisine options, with plenty of fried foods. Dallas is home to the state fair, which features the largest ferris wheel in the western hemisphere. You’ll also find a variety of attractions that top the charts at Six Flags Over Texas, such as the largest oil derrick on land. Dallas is home to the largest urban arts district in the United States. You’ll find that the high disposable income of its residents leads to many patrons of the arts and culture. Museums and art galleries tend to be well-funded and full of classic and modern art for you to peruse. The frozen margarita machine was invented in Dallas. When you’re out for a night on the town, make sure to celebrate by drinking one of these frozen concoctions. Dallas is centrally located not just within Texas but also within the country. You’ll find most destinations within the US are only a four-hour or less flight away from Dallas. That’ll give you easy access to explore the rest of the country. There are also two airports you can utilize, the Dallas-Fort Worth International Airport and Dallas Love Field. Most people are familiar with the Dallas Cowboys, one of the country’s most popular football teams. You’ll find other teams in Dallas, including the NBA team, the Dallas Mavericks. The stadiums for these teams are just as big as the rest of Dallas. In fact, you could fit the entire Statue of Liberty within the Dallas Cowboys’ Cowboys Stadium. While you’re out enjoying your football, there’s something to be said about nicknames sticking. A Dallas oil man who also happened to own the Kansas City Chiefs dubbed the NFL championship game as the Super Bowl. You’ll find that the city of Dallas is a great melting pot of people, many of whom aren’t from there originally. Because of this, you’ll find a lot of varied expressions. For instance, some say, “fixin’ to” and “how y’all doin’?” You don’t have to use these expressions but be prepared to hear them. Cowboy boots are acceptable footwear in most situations in Dallas, with even CEOs wearing them to work. Make sure it’s appropriate for your workplace before you start wearing them and break the boots in before you expect to wear them comfortably all around town. Dallas is the home to the original Six Flags. Named for the different flags that at times flew over Texas, including the Spanish and American flags, this theme park has a great deal for thrill ride enthusiasts. Make sure to come prepared for water rides, roller coasters, and world-class shows. When you move to Dallas, you’ll find the normal issues with navigating a new city, as you learn your routes to the gym, grocery store, and work from home. What’s different about Dallas is that the highways tend to go by multiple names, making it very confusing for newcomers. It’ll take time to learn that each road may have two very different names as they memorialize people. You’ll find when you come to Dallas that most people are friendly. You’ll get used to the peppering of “Howdy,” “sir,” and “ma’am” throughout your normal conversation. You’ll also find men tend to tip their hats at ladies. Dallas is home to numerous Fortune 500 companies, as well as billionaires that top the charts. It is only surpassed by New York City for the number of billionaires that live there. There’s a reason the arts and culture are so important, with a vast amount of disposable wealth. Tourists and locals alike will find plenty of places to shop for clothes, furniture, and other necessities in Dallas. Brands like Neiman Marcus have made their home in Dallas. In addition, there are shopping malls, such as the West End MarketPlace and North Dallas’ Galleria. Dallas’s Woodrow Wilson High School has graduated some very impressive students. Two Heisman winners have passed through their halls, as well as musicians such as Steve Miller from The Steve Miller Band. Dallas has been the filming location for numerous movies and TV shows. You never know what might be filming around the corner from you, so keep an eye out. You can thank Dallas for the ATM, where it was first invented. It’s also home of the company Texas Instruments, which produce calculators, among other tools. You’ve probably used a TI-83 in classes. The integrated computer chip which later became the microchip was also invented in Dallas. Dallas is home to many greats: great food, great sports teams, great music. You’ll have plenty to enjoy and explore when you move to your new home in Dallas. To find your new place, be sure to check out homes for sale in Dallas on RealtyHop!